This is my all time favourite risotto recipe. I have made many risottos in my time, and most of the recipes and flavour combinations I come up with are inspired by ingredients we have at home already. I know I have posted a risotto recipe before, and now I look back at it, the addition of quinoa must have been a temporary glitch in my risotto making system. I have no idea what I was thinking. I could happily eat this dish every night for dinner. 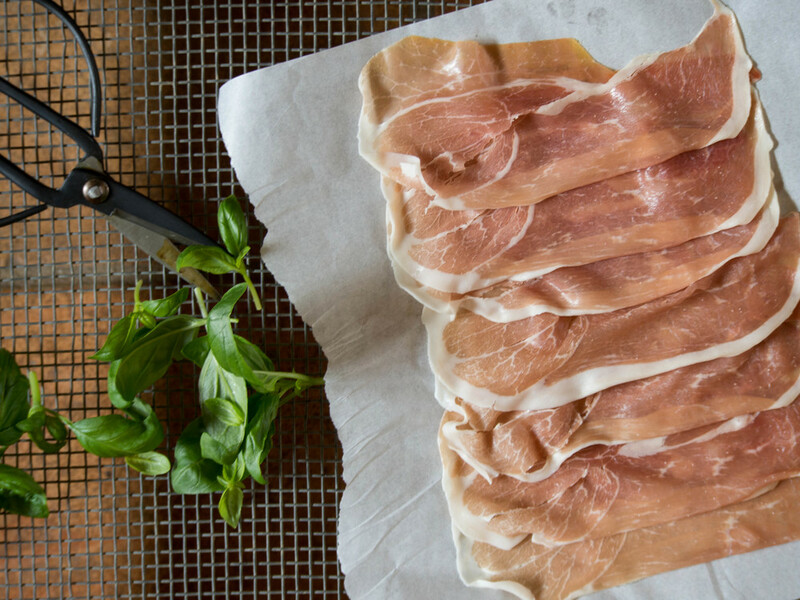 Though I fear the daily use of prosciutto would drain my bank account rather quickly. Pancetta or (cooked) bacon would be great substitutes. 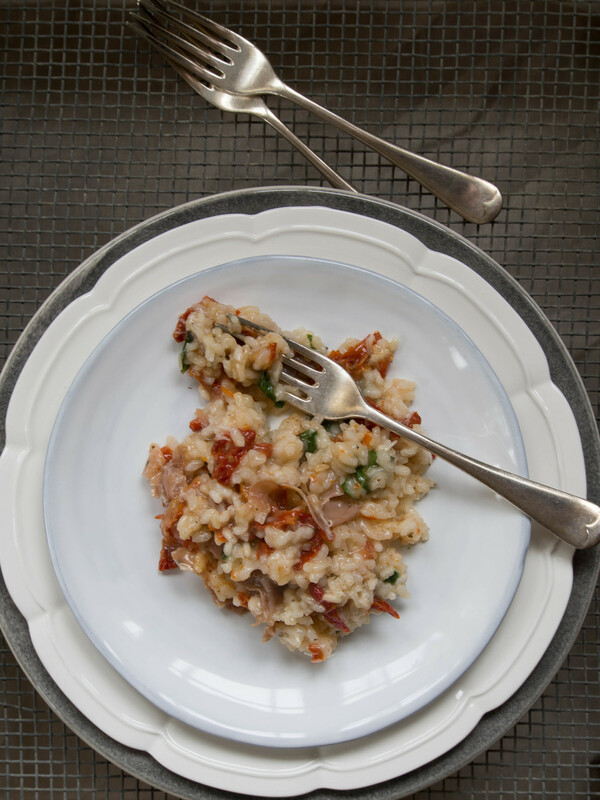 Really, if you use the plain risotto recipe as a base, you can add just about anything. In a large heavy based pan on medium heat, heat the garlic oil (about 1 tbsp). Add the arborio rice and stir to coat the grains. Add the white wine. Stir occasionally, and allow the wine to be mostly absorbed by the rice. Once most of the wine has been absorbed, add the chicken stock. Turn the heat down a little, as you don’t want to stock to boil. Place the lid of the pan on loosely. Stir occasionally, ensuring that the stock does not boil. The rice should absorb most of the stock in about 30-40 minutes. You do want this process to be slow. 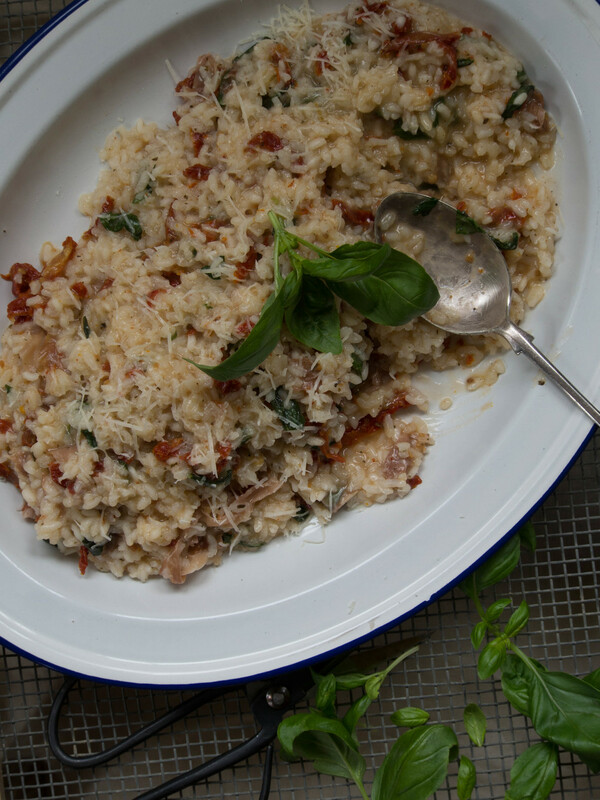 Once most of the liquid has been absorbed by the rice, add the parmesan cheese, tomatoes, basil and prosciutto. Stir so all the ingredients are well distributed in the risotto. Turn the heat off and leave to sit for a couple of minutes. 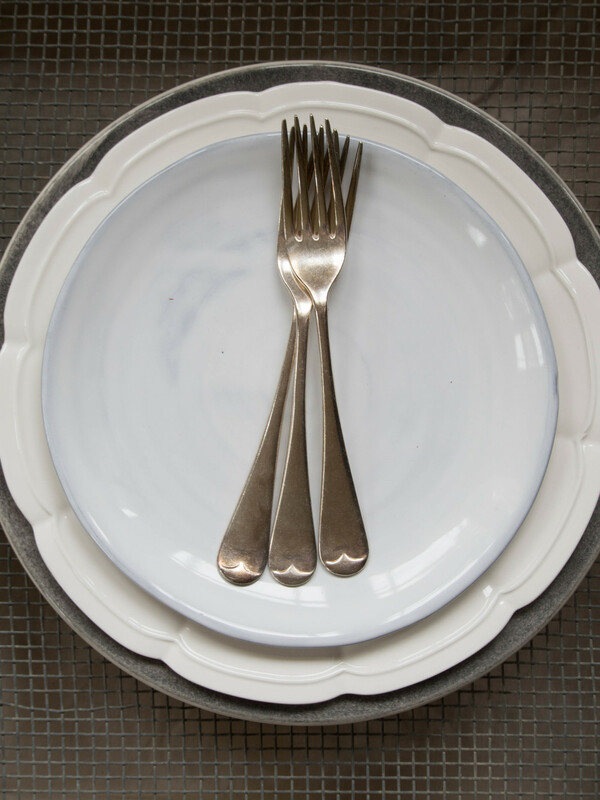 Serve with an extra sprinkling of parmesan cheese. How was everyone’s Easter? Mine was nice and quiet, though didn’t quite involve quite as much baking as I thought it would. I have been feeling a bit flat lately, and I just didn’t feel like being in the kitchen that much. I ended up watching all the Harry Potter movies, completely out of order lol! We also had a day trip down to Bowral yesterday which was really nice, especially having tea and scones at Your Vintage Occasion which is part of the complex with Dirty Janes antique shop. I had some lovely rose scones with rose scented cream and berry jam and they were just divine. 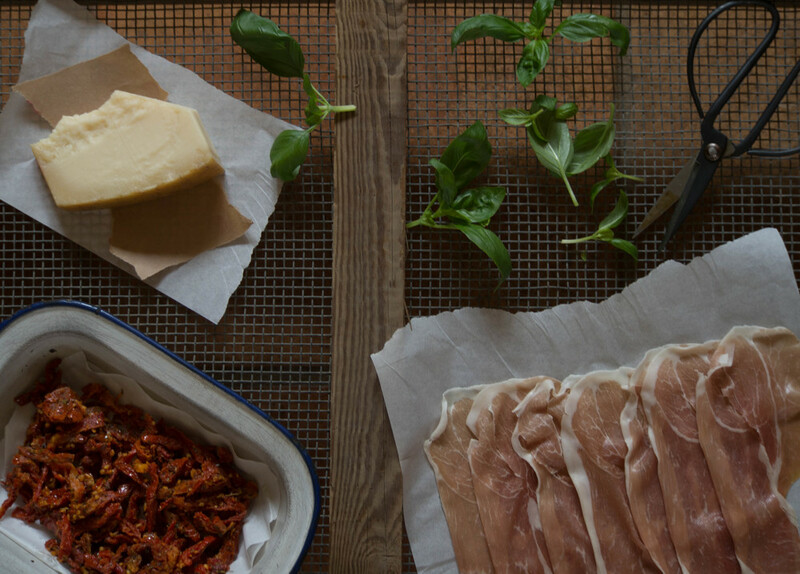 And today I am making a slow roasted shoulder of pork with quince from @georgiepuddingnpie’s new book Taverna - and to say it smells good would be an understatement! I am so looking forward to dinner! Hopefully the next few days brings with it more time in the kitchen.